Classic and Retro D&D - Old TSR D&D adventure PDFs available from Drivethru RPG. Old TSR D&D adventure PDFs available from Drivethru RPG. Re: Old TSR D&D adventure PDFs available from Drivethru RPG. How did I miss the announcement!? So let's get this straight... official copies of older edition D&D and modules are now available in PDF form on RPGNow and RPGDriveThru. And not just the free consolation stuff that they used to give away on the Wizards' site. Titles here are from Basic D&D, AD&D, right through to 4th Edition. 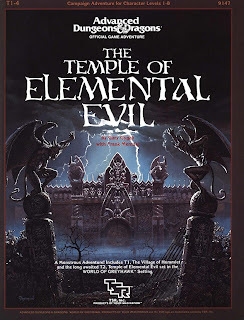 It's currently an eclectic mixture at best, but I'm ecstatic because (without even thinking) I've just bought (Moldvay) Basic Rules, B5 Horror of the Hill and T1-4 Temple of Elemental Evil. 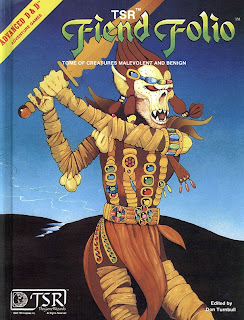 Regarding the latter, like everyone else in the early 80s, I owned T1 Village of Hommlet but it took so long for ToEE to arrive that I think I started spending my money elsewhere. Compared smelly second hand stuff to Ebay - the prices aren't so bad for the older edition products: $5-$10 - For some players it will be the only way they will see these archaic tomes. The more recent edition products are possibly orientated at the tablet-at-the-game-table market - since the 4e glossy hardbacks are still on sale elsewhere. The Moldvay Basic Rules look great. It's faithful facsimile scan. The text is selectable and copyable. The contents don't appear to be hotlinked/tagged - which will disappoint some PDF perfectionists - but it's a tiny ruleset by modern rulebook standards. You don't get too lost in 64 pages. The black and white line art illustrations are all in there - it's a high contrast scan - there is slight pixelation and some tiny details are lost, but at a mere 7.5 MB the document is extremely portable. A skeptical person might see this latest move by WotC of making all the PDF's available again as one not meeting any demand (which has been there for several years) surge, but a move that re-asserts copy and image protections. That same skeptic might wonder about the batch of C&D's that several small minis companies have received in the past few months. Monsters that were not formerly on the "exception list" to the OGL are now being protected. Not surprisingly, a couple of these companies had just completed successful Kickstarter projects. What might cause that same skeptic to wonder about it all is that two large (for their respective markets) companies have not heard a word. The skeptic might really scratch his head when one of the companies product lines looks like it was sculpted straight out of a MM. It doesn't feel like an assertion of property. There's a few PDFs on there - older modules which I think Wizards were giving away on their site a few years ago - I could be wrong. It could be anything from seeing that Paizo sell PDFs of older stock, to an acknowledgement of the OSR - but more likely, a much cheaper way of making money out of old documents than by selling them as bound collector's editions. There's no overheads on OBS (only % when sold). The selection is very odd - random, even. I think Wizards really underestimated the desire for the limited edition reprints - although 4e seems to have an established market, much as I like to knock 4e. So many folk are playing online with VTT and chat software - and actually like onscreen rulebooks. Tablets are also at the table now - apparently people like having a rulebook and searchable PDF - not necessarily exclusively one format vs the other (judging from forums and blogs) Wizards' own online stores are fairly baffling (I.e. find your nearest retailer, and D&D Insider deals) - perhaps the whole thing is an experiment - outsourced to the One Book Shelf sites, who normally take 40-35% per document - but this was a sudden launch - maybe a deal has been struck. I think the 3rd edition fans will welcome access to a few of the books on there. Pathfinder is effectively the D&D3 lifeboat -still going strong. 3e core book reprints were popular too - the Dracononmicon is easier to release as a PDF than gamble with printing. I've given up trying to understand Wizards in terms of product lines or community. For example, I'm guessing that they don't plan to use OBS's print on demand service - despite the fact that POD fulfils niche hobby orders. Maybe PDFs are less threatening to people in marketing who might be focused on matching hardbacks in shops? Did you see the voting page for Rules Cyclopedia? RC would be a real winner - because it's "complete". The AD&D 1e and especially 2e would be a nightmare to rerelease in printed form because the ranges are so broken up between so many texts. I'd be interested to see if Wizards have rights to the original D&D texts (white/Brown box). The bootleg PDFs we've seen for those have been dire. It pains me when I read their description of AD&D implying that it is the same game that was being played in 1974 - I.e. the "first edition". Mortis, am I right, do you think the UK literally saw a lot less copies of RC than the US? I almost never see them on the UK eBay sites. Did it come out about the same time of GW moving away from RPG imports? 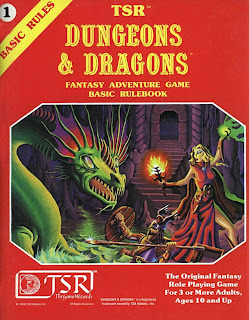 I think my attention was still mainly on AD&D - although now, I'm very proud of my boxed sets. I must express here, that for along time I was unaware the RC ever got released (I'd never seen a copy) that was until I started talking to people online and seeing photos. This leads me to the suspicion that perhaps the RC was never released in the UK. I don't know - maybe some one in the UK will swoop in on this thread and tell me I'm wrong, and that they own a copy they bought at a Virgin Megastore (remember when Virgin had an RPG section?) or Orcs Nest. Yes this was the early to mid 90's and the beginning of GW move away from RPGs to concentrate on their wargames, the popular perception of the market was RPGs were on the way out. The UK miniatures and RPG industry sadly still lives the shadow of GW and that shadow now reaches across the world. Obviously I only downloaded (and printed) the free B1 Module just for curiosity. I agree with BB, the quality is really good. By the way I'm happy to see old stuff around again! Yeah, a reprint of RC should be great. I always loved/hated it, maybe because it never be translated in Italian by a hair ( ). So I think I will surely buy it. We live in interesting times. WotC seem to have changed their minds about PDFs and older editions in a big way. It's interesting reading on different blogs that people are worried about the effect all of this will have on old-school retroclones, which still have their own merits. I'm fascinated to see players asking about the RC B/X and BECMI - so often the sidelined by AD&D. 2e AD&D ? But there's so many rulebooks! Certainly it's better organised than AD&D with it's UA revision - and has loads of fans out there. I think you're right about RC - I may have seen one in a tiny corner of a Virgin Megastore along with MegaTraveller and a handful of White Wolf games. Dark times! It's a much better quality scan than the Scribd copy, the text is selectable -with a table of contents -but the hotlinking wasn't working in the copy on my ipad. Never owned a copy of the RC myself (I have the boxes) so having the PDF is a real treat. 300+ pages of straightforward easy-to-understand D&D rules. Check out the "Product History" - very interesting.